Yesterday we announced our 4200mAh metallic device Ulefone Tiger and we believe many of you have been looking forward to buy it. There will still be a few days before its presales, but now a chance comes for you guys to win it for free! From October 11 to 17, please go to this page and vote for 3 specs you like the most about Ulefone Tiger while submitting your email account and the link to your social media page. 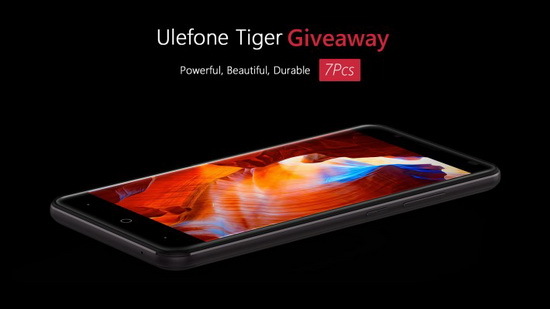 Everyday we’ll randomly choose 1 lucky participant and the gift will be a free Ulefone Tiger. And after the presales end, we’ll ship all the 7 gifts to the winners. Ulefone Tiger has been an amazing phone with brushed metal unibody, 4200mAh Sony li-polymer battery, 2GB RAM, 16GB storage, Sony IMX219 camera, and fingerprint scanner. So why not try your luck without any work?